As we made our way further north, we drove into redwood country, where the majestic giants tower above the other flora that has sprung to life. 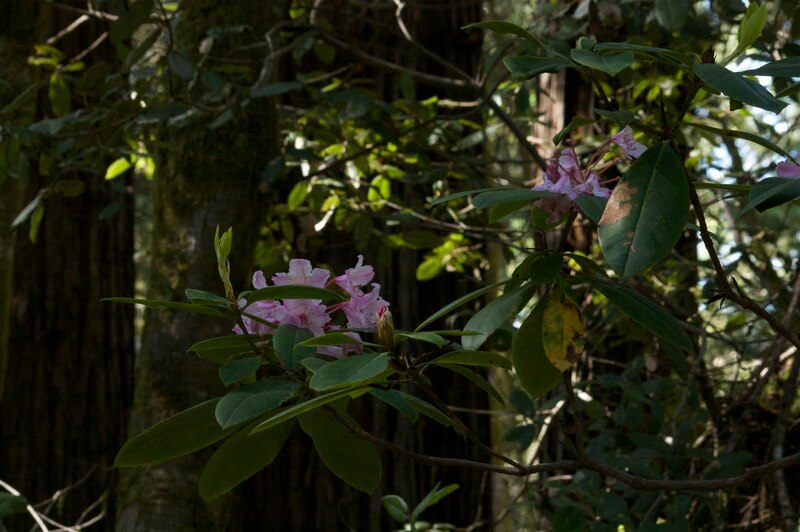 Particularly, the rhododendrons growing in the shadows of the redwoods added a splash of extra color to the lush ground cover of ferns and mosses. Where the redwoods give way to open spaces, other flowers are in full bloom, poppies, lupines, as well as many other nameless flowers cover the fields and color the roadsides. In Fort Bragg, we had our first real plans, a ride on the Skunk Train, and a visit to Glass Beach. At the peculiar Glass Beach, the sands are covered in glass, left over from when this area was home to the city waste disposal. The beach has since been cleaned up, but the many glass bottles that ended up being thrown away were slowly eroded into small rounded pieces by the ocean's might. Oddly, what once was the town dump has now become one of it's most well known attractions. 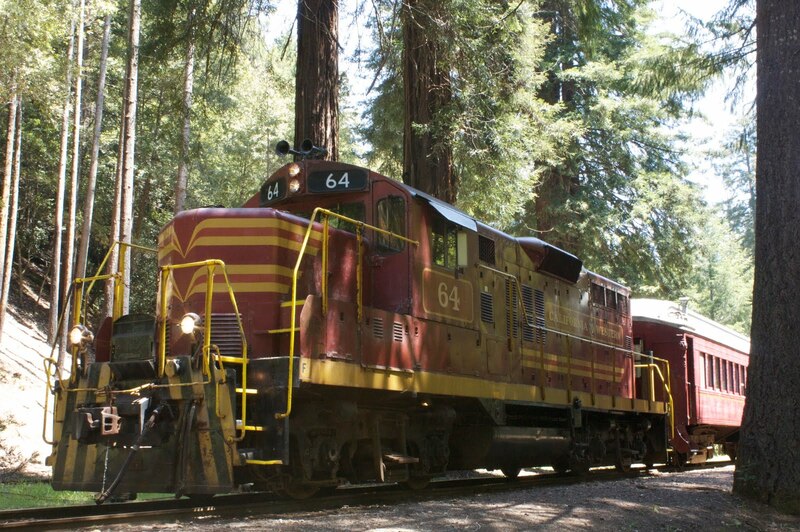 The Skunk Train is a relic of the Fort Bragg heyday, back 100 years ago when loggers came through and obliterated the vast majority of the old growth redwoods. They built a train to carry workers and presumably logs from logging camps back down to the lumber yards in Fort Bragg. Today, the Skunk Train provides tourist a glimpse of what the area was like back when logging was big business. Despite being completely logged, the thousands of years old trees have regenerated rather quickly, and the redwoods are again thriving. Redwoods ae able to sprout new shoots from their millennia year old root structure and in some places creating "fairy circles", a ring of trees growing in a circle around an old stump. For Elias and Frêney, the train ride was less about the trees than the ride itself. Just being on a train was exciting enough and even more so with the "Train Singer" who came up and down the aisles singing songs for the passengers. Heading north from Fort Bragg, the Lost Coast will remain lost until some other time. While we did try to make it through the winding muddy logging road to Usal Beach on the southern edge, we reluctantly turned back not wanting to risk getting stuck should the rain make the road any worse and bar our return. From where we turned back we could just see the beach nestled between steep cliffs dropping into the turbulent ocean. Yet despite being turned back we were able to get a sense of the Lost Coast camping on the bluffs above the Pacific just a few miles further south. It was here we awoke on the Norwegian national holiday, a dramatic and scenic background for our little parade along a beautiful secluded beach in a drizzle.